So, what does it need in order to thrive and allow us to thrive? It needs to be left alone, as much as possible, to do what it does. When we advocate ‘no dig’ gardening in permaculture, this is what we mean. We don’t mean – “thou shalt not dig up thy potatoes” or that you’ll be struck by lightning if you double dig. The former is a necessary part of harvesting a crop, and of course must be done. The latter may be deemed necessary in certain circumstances – like bringing heavy compacted soil into cultivation for the first time- but it is damaging to the soil life (which mostly lives in the top 10cm of soil) and should therefore be avoided if possible. Having said that, once the structure of the soil has been improved it will be a better environment for soil life, this is why we don’t preach against digging when needed, just when it is done routinely, without question. 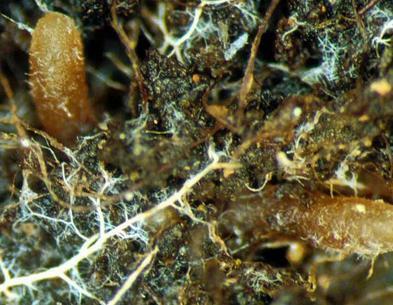 Plant root tips with delicate fungal hyphae and mycelium. Digging or tilling the soil damages soil life in various ways. Earth worms are physically damaged and exposed to predators – likewise with larger creatures like beetles and spiders. Fungi produce large fragile webs of mycelium which connect up different rhizospheres (plant root systems) and transport nutrients between plants – this mindboggling system plays a huge part in how plants get their needs met, and can also be physically broken by working the soil. The smaller organisms such as bacteria and protozoa are harmed by being exposed to too much light and oxygen. When the soil is turned light and air flood in and eventually cause the microbes to die – these microbes are the foundation of this huge and diverse food chain. Dry soil being eroded by the wind as it is ploughed. Digging is also, quite frankly, very hard work. Terrible for the back and knees, as I can personally vouch, and therefore not very sustainable in human terms either – do we need to return to a medieval life of drudgery? No we don’t. These big brains of ours can do better than that, and better than fossil-fuelling ourselves to extinction. On a larger scale digging means ploughing and apart from the obvious fossil-fuel issue of using large machinery, there are other costs: compaction, loss of soil structure and loss of humus are serious issues. Sadly in broad scale organic agriculture repetitive ploughing is often the primary method of weed control, other methods being unviable on a large scale (many things are unviable on a large scale, which is why bigger is not necessarily better). 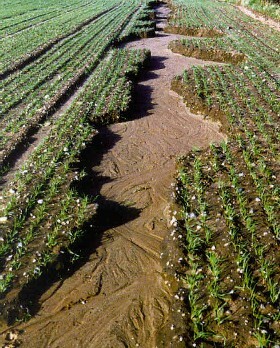 A ‘rill’ in a wheat field following heavy rain – the top soil is being washed away. A fertile soil is about 50% pore space, ie: varying proportions of air and water depending on the weather and other factors. These spaces are essential for the life within to move about, breathe and take in water. If there’s no space, there’s not going to be much life either. Not only this, but once soil has lost its structure it is much more vulnerable to erosion by wind and rain. Here in Devon the red streak of earth running out of farmers’ gates is a common sight after heavy rain, and that is hundreds, maybe thousands of years worth of soil disappearing. But of course it doesn’t disappear, it ends up somewhere else – rivers, drains, sewers, mainly where it’s not wanted. Not only this, but when the whole world is ploughing, causing all those surges in microbial activity, huge amounts of CO2 are released into the atmosphere. So much so, that the emissions caused by the tractors driving the ploughs pale into insignificance. Some say that if the world stopped ploughing tomorrow we could halt climate change. Quite a thought. A common reason for working the soil is to combat perennial weeds. Docks, thistles, creeping buttercup, dandelion, bramble – they all have something in common – they are vigorous, competitive and persistent, and they must be managed if we want our crops to thrive. They have something else in common too – they propagate very easily from root cuttings. Most gardeners know that if you break off the tiniest bit of dandelion or dock root when pulling them out, a new plant will grow before you know it. So what happens if you plough or rotivate? You increase these weeds ten-fold. Permaculture is all about forward thinking – creating solutions before there is a problem. Charles Dowding, the well known no-dig gardener and author advocates a zero-tolerance approach to weeding. Never let a weed get too big for hoeing if possible. Hoeing only affects the top centimetre or so of soil and causes very little damage to soil life. Charles Dowding’s market garden; mulched with compost and regularly hoed. See it, feel it, smell it, know it. Get to know your soil and understand what it needs, before doing anything else. Learning to take a soil profile or a texture test are two very simple ways in which we can get to know our soil, and they are well worth doing. A texture test will tell you about the mineral particles that make up your soil, and the different characteristics those particle combinations have. For example, a sandy soil is usually well-drained, possibly drought-prone and often acidic. A clay soil can be prone to compaction and waterlogging if the structure is poor, but responds well to improvements and is very fertile. These are the opposing poles of soil texture and there is a sliding scale of everything in between including silty soils and loams. Knowing the texture of your soil can have a big influence on how you manage it successfully. A profile sample can tell you many things, from the levels of organic matter to the depth of your topsoil and the structure. Looking at colour, smell, root penetration, soil life, crumb structure gives you a very comprehensive picture of what you’re dealing with. A PH test may also be worthwhile if you want to grow a wide range of fruit and vegetables, or plants which you know prefer a particular PH range such as ericaceous plants and the Brassica family. Give it a good start. If you are starting out with a soil that needs some form of improvement, you must get that soil into a condition where it can begin to thrive and become the growing medium you need it to be. If your soil is heavily compacted, there are a series of measures that can be taken depending on how bad the situation is. If it’s had a bit of footfall and just needs loosening up with a fork this can be done very quickly by working across the ground in rows (as if you were mowing the lawn), pushing a large fork deep into the ground and pushing forward, then puling back. You are not lifting or turning the soil, simply making holes into which air and water can penetrate, creating niches for life to take hold. Once the air, water and life have got in, they will do the work for you. If the situation is worse than that you could consider digging the ground over, and if you find your compaction issue is very severe, you may choose to double dig. You may need to dig or double dig for a couple of consecutive years or more to relieve the problem, but once the crumb structure is good, you may never need to do so again, and that makes it all worth while. Leave the soil to its own devices to recover and thrive. 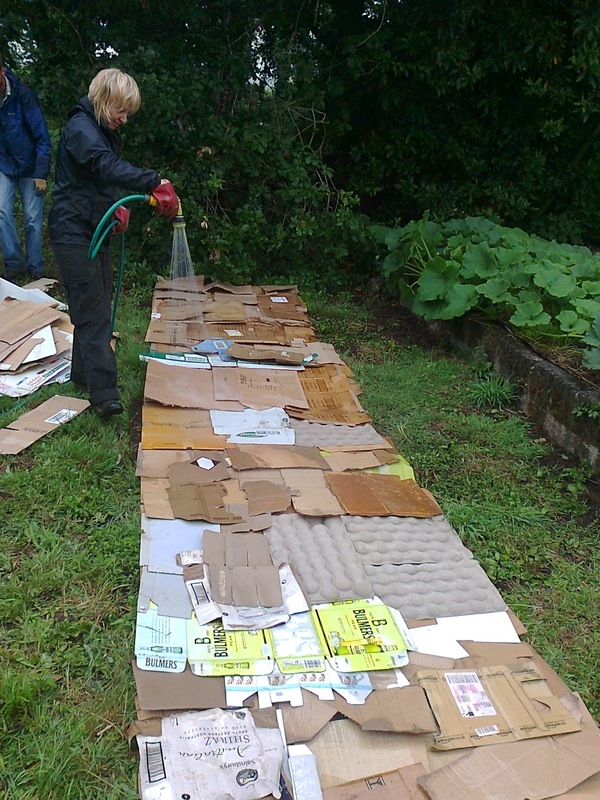 Soaking the first layer of a 3-layer organic mulch: 2-3 layers of corrugated cardboard. A great way to bring new ground into cultivation is by mulching. A clearance mulch is a non-living ground cover that blocks out light and kills off existing vegetation (weeds or grass) to clear the ground for growing what you want. If you want to increase the organic matter content at the same time I highly recommend using a three-layer organic mulch. The first layer is several layers of cardboard, followed by a 3” (8cm) layer of compost and/or manure, followed by a top layer of straw, or dried bracken, or whatever you have to hand that will form a barrier to weed seeds and protect the mulch as it does its work. After a full growing season the existing vegetation will have been killed off, the cardboard will have broken down and the worms will have mixed in the compost and manure, creating a beautiful, dark, rich topsoil. Peeling back the top matted layer to reveal this beautiful substance, really is a wonderful experience! You can gain further satisfaction by growing a crop in the space while the mulch is doing its job, although it’s worth following good instructions for the classic ‘3-layer organic grow-through mulch’ to ensure success (see The Earth Care Manual P195). There are many ways of mulching and many different materials that can be used. It’s worth experimenting and researching to see what will work for you. Keep on top of it! 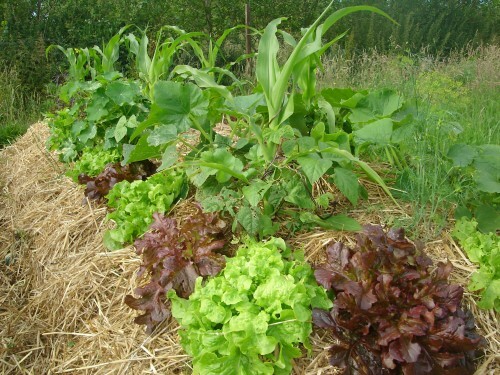 An annual polyculture of lettuce, squash and sweetcorn, mulched with straw. To maintain your soil at a high level of fertility, which is necessary when obtaining a yield, you will need to routinely add more nutrients and organic matter. Organic matter has a limited life and needs to be replaced in the form of compost or well rotted manures. This is usually done in the winter when beds are empty or plants are dormant. It will gradually be worked in to the soil by the time plants begin growing in the spring. During the growing season you can use compost as a maintenance mulch to add fertility while also protecting the soil from erosion and water evaporation. The one drawback of using compost as a maintenance mulch is that weed seeds can get into it and grow happily. This means you’ll either need to take Charles Dowding’s approach and hoe regularly, or use a different material which will act as a barrier to seeds. Straw is commonly used, but be resourceful and use what you have on site if possible. We use Crocosmia and fern leaves cut from the previous growing season. By constantly working on top of the soil there is no need to disturb it, so you have a win-win situation of less work and healthier soil and plants. The key then is to make sure that you don’t have to actually get on top of it to keep on top of it. 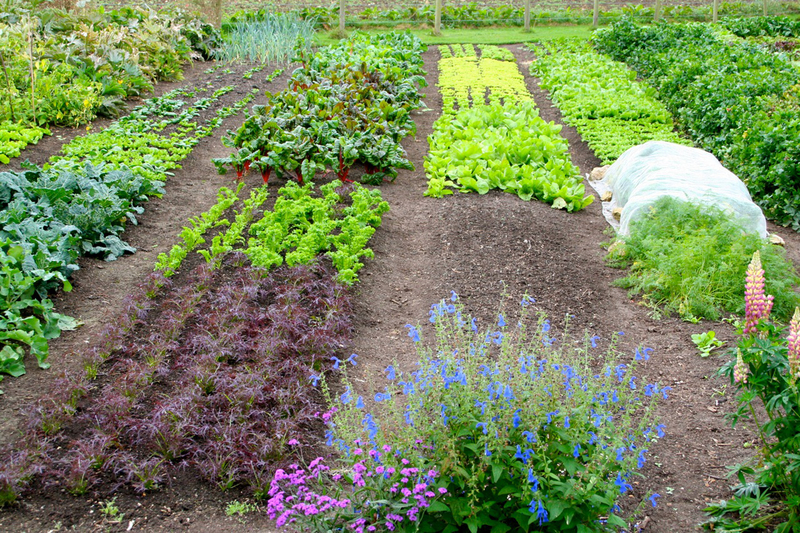 Raised bed systems are ergonomic growing beds that maximise top soil and minimise compaction. A raised bed doesn’t need to have physical ‘sides’ like planks or walls, it just needs to be the right size and shape to be tended with out being stood on. The beds become raised when top soil is dug off the paths and added to the beds when they are created forming slight mounds. The beds are generally around 1m in width to allow access to the middle by reaching in from the paths. Over time the beds maintain their mounded shape as you add compost on top, and the increased topsoil depth allows closer planting and higher yields. So it’s really very simple when you think about it. You begin by understanding the environment as a system. You think about what it needs, and what you need and find a way to become part of those systems – taking out and feeding back in. An ecosystem may be complicated but being part of it in a healthy and balanced way needn’t be. That is beauty of permaculture design and the wonder of nature.